Large antique brooch, view of Louvre and River Seine, fixé sous verre miniature. In Fine Jewelry > Brooches > Show & Tell and Fine Art > Paintings > Show & Tell. I caught it last week from England, arrived today! 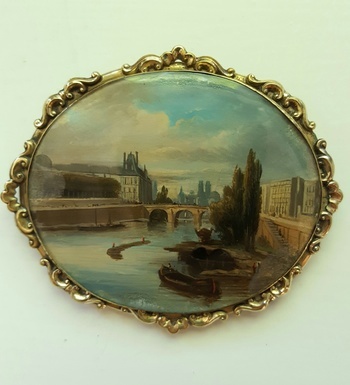 Amazing details on this miniature, painted on the reverse of a slightly domed glass, mounted as a brooch, around 1850, metal is either pinchbeck or pomponne, a Zinc/Copper alloy. 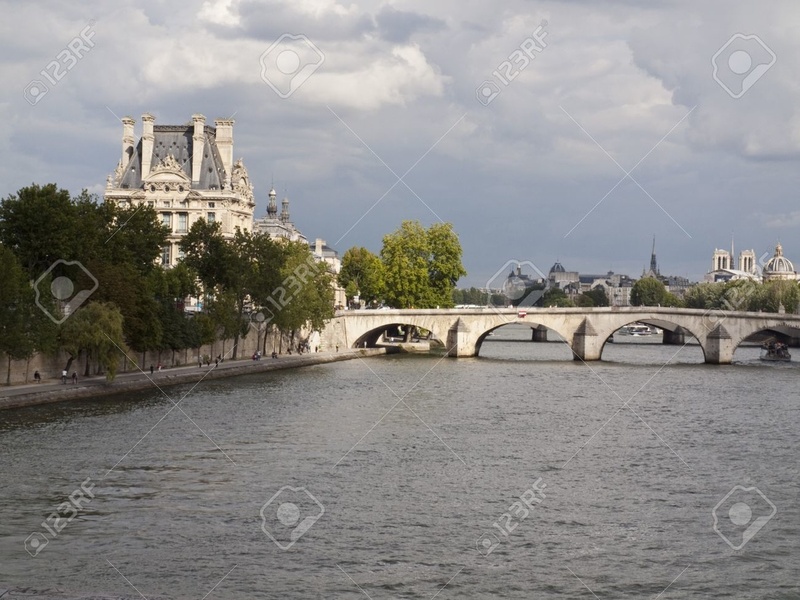 I immediately recognised the river Seine, a view of Louvre, on the left, the Pont Royal (built between 1685-1689 during Louis XIV reign, by Jules Hardouin Mansart) and Notre Dame cathedral in center right back ground. Pic#4 is the nowadays view. This is a very large brooch! This is so amazing! What an incredible brooch. 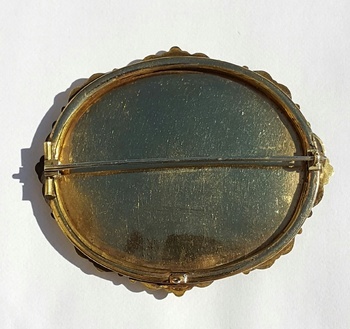 I can only imagine the lady who once wore this lovely brooch. 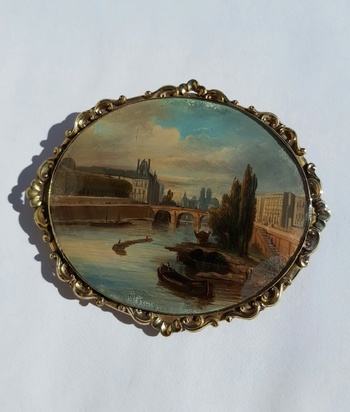 Seeing this beautiful brooch homesickness to see Paris one again. Absolutely stunning brooch, with so much detail!!!! Really, really love it !!!! Beautiful brooch and great post that makes us able to compare! Thankyou for sharing. Scott, thanks for being so quick to comment and love! 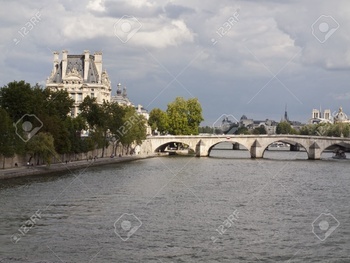 Marga, if you happen to come to Paris again, it would be nice to meet! Thank you ! Elisabethan, I had the luck to find a photo of the same view on the net, I agree it shows the accuracy of the landscape to compare. Many thanks to all of you 22 lovers and friends, love back to you! Vintagelamp thanks a lot too for your lovely visit and nice comment! How pretty. It's great to see it with the modern photo. Vintagefran, thank you for your love and comment! I was delighted to be able to find the same view (and the brooch!). Many thanks for all your highly appreciated loves, Rick! Aww, thank you Ho2 and all 35 lovers!!! Didn't know it not the first time ...wonder why they didn't have boats built over the years to shoot water from the canals if needed ..
Happily major treasures, great organ and the rosaces aren't destroyed. Even the rooster which was on top of the collapsed spire was retrieved!